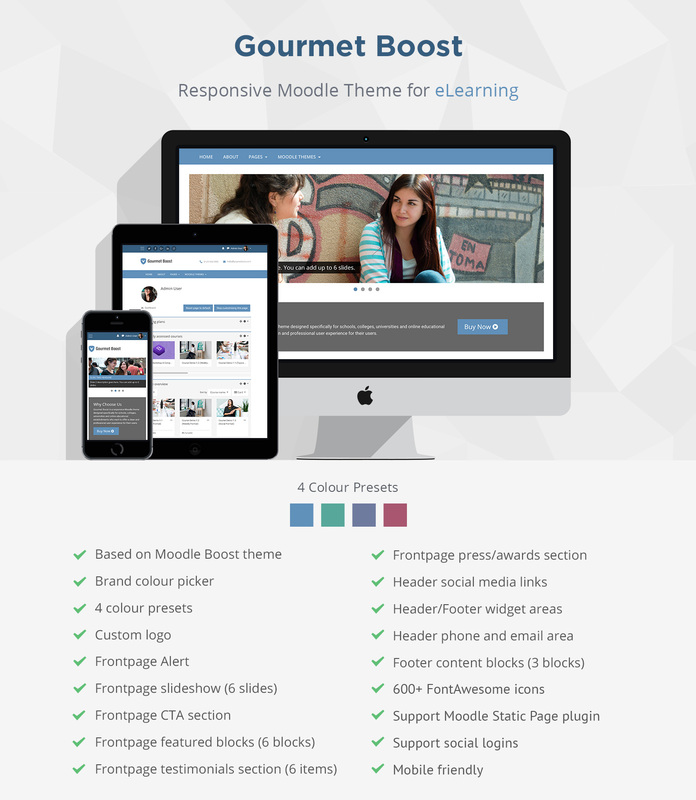 Gourmet Boost is a responsive Moodle theme perfect for colleges or universities. The landing page has all the essential elements for promoting your e-learning portal and courses. The overall design is clean and professional and especially tailored for higher education Moodle sites. It’s built based on Moodle’s core theme Boost and comes with 4 preset colour schemes. You can easily pick own colour scheme by overriding the default branding colour. This theme uses the latest Bootstrap 4 framework so there are plenty of handy Bootstrap components you can use within your Moodle site. We have released a responsive Mahara theme “Groove”, which is designed to visually match our Moodle theme “Gourmet Boost”. If you are planning to set up a seamlessly integrated Moodle and Mahara installation (“Mahoodle”), you need to check out the “Groove” theme. Extract the /gourmet_boost/ folder and the files.